Check out our season beer list. 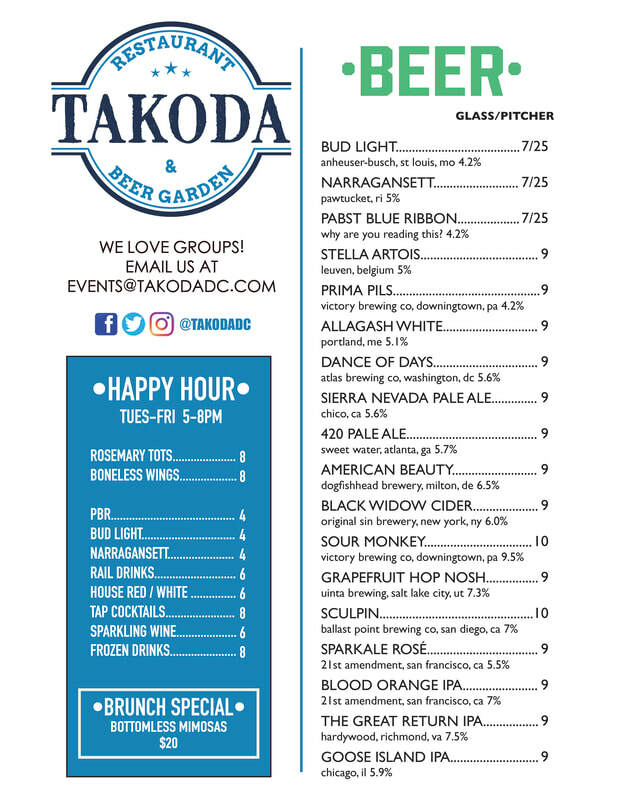 We've established relationships with all of the best local brewers in DC, and continually refine our menu to ensure we have a selection that fits nearly any palate. Regardless of preference, we stock basic, craft, and local brands. There's something for everyone; be you are a cicerone, or even just a casual sampler. Ask our bartenders for the latest specials, seasonal favorites, and upcoming releases before they hit shelves. We also take requests - If there's a specific beer we don't have, let us know and we will take your input into consideration for the following months. TAKODA takes pride in handcrafting our menu weekly - check back for important updates, changes and announcements from our stockroom.